The competition events listed on this page are in date order. This list of competitions is updated as information is made available. Events mayi be listed or updated with the SELF-SERVICE SUBMISSION FORM. West Coast Swing Workshops, Competitions and Social Dancing. Come see the best of the best compete and meet new friends. 3-Day West Coast Swing event, with social dancing, workshops by national instructors and competition in Jack & Jills, Strictly Swing, Classic, Showcase and Team Divisions. As well as Pro-Am divisions. Dance in DuPont Circle, 2-5 pm, FREE! All events are open to the public with the exception of college-only competitions! Twelve hours of great music, top notch performances, engaging activities, for all ages, skill levels and dance. Clarion Hotel Conference Center – Minutes from the Airport. Free shuttle. World Swing Dance Council Registry Event. Superstar Show featuring top talent. Fun competitions for everyone. $1 Newcomer Jack & Jill. NASDE and Professional divisions plus Rising Star divisions. Pro Am Team challenge, Jack & Jills in Swing, Lindy Hop, Hand Dance, and Hustle. World Swing Dance Points. Swings, Pro-Ams and Team division. 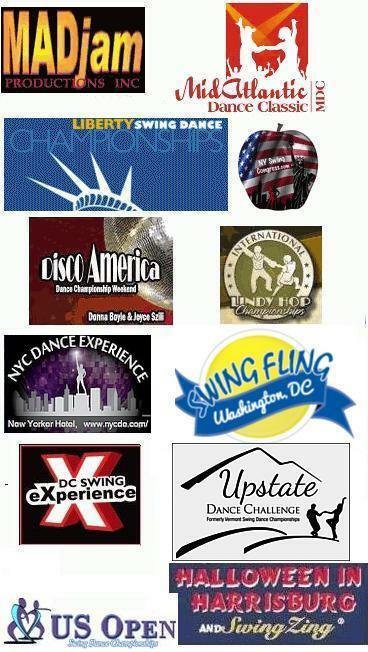 We will have top instructors from the West Coast Swing community teaching and judging. The event is held at the beautiful Hyatt Regency Hotel in New Brunswick NJ. FREE to attend those two dances. New UCWDC qualifying weekend dance competition in the Baltimore Maryland area -- includes all divisions and levels of Country Couples, ProAm and Line, plus Strictly Swing and Hustle Couples and ProAm, as well as Workshops, Jack & Jill WCS and 2-Step, Fabulous Dinner Show, dance shoes and clothing vendors, and lots of social dancing. #1 Mixed Dance Event in the world. Hustle, Salsa, West Coast Swing. WSDC and IHDA sanctioned event. Full Roster of competitions: ProAm, Amateur, Professional and Jack and Jill. Social Dancing in 3 Dedicated Ballrooms. Daily poolside dance party. Saturday Dance Dimensions Gala. 1 Mile from Disney World. 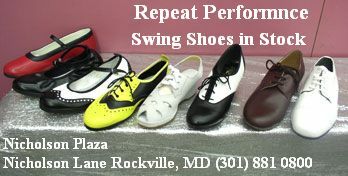 Swing Into Spring with one of America's great Dance Events - Swing Dance America! * Saturday Night Gala Entertainment "Show"
* Classic "A" and "B"
Club, a City, a region, a State, a Studio, a group of states, etc..
Balboa competition sponsored by the All Balboa Weekend! 15th Annual Swing Dance Championships - $30,000 Cash & Prizes..
Master Of Ceremonies: Mario Robau, Jr, Chief Judge: Angel Figueroa. Professional Classic, Showcase & Strictly Swing - Rising Star (Advanced), Classic, Showcase & Strictly Swing, Non Pro (Intermediate) Routines & Strictly Swing, Amateur Novice Routines & Strictly Swing. Male & Female Pro Divisions (Both Novice & Non Pro (Intermediate) Levels. . Masters Routine Division and Masters Strictly Swing. Mixed ProAm Routine Division, Teams Division. Jack & Jills all levels. WSDC points. 4X Nights of Social Dancing! Strictly Swing, Strictly Lindy, Jack & Jill, Teams, Open Swing, Rising Star, Pro/am & Top Teacher. West Coast Swing Jack & Jill finals will be danced spotlight format! which will be begin on July 17 Saturday night will feature a fantastic performance show called Miami Dance Magic Spectacular and competitions with the Champion dancers will be part of the show. We are having strictly and jack and jill competitions in all levels and we are sanctioned by the World Swing Dance Counsil and the International Hustle Dance Association. Sanctioned UCWDC qualifying event. Placement points will be awarded. Workshops, All Competition Divisons, Line Dance Competition, Honky Tonk, Swing and Hustle Competition! West Coast, Lindy Hop, Hustle, Salsa, Two-Step, Cabaret, Jack & Jill, Teams,14 great workshops, $15,000 in Cash & Awards! Sanctioned Shag Contest for CSA Amateur, Novice & Pro Divisions, non-sanctioned Jr I & II and shag workshops. Sponsoring shag clubs: Northern Va, Richmond, Virginia Beach & Colonial Shag Clubs. Features the top couples, pro-am, teams & line dance competitors from over 15 countries in Europe, plus USA, Canada, Brazil, Australia, Japan, Indonesia competing for over $75,000 total in prizes (cash and gifts). New: Swing and Hustle in a separate Pro Am competition with relaxed rules, routines are allowed an a WSDC Jack & Jill swing comp. • Four Nights of Dancing! • Battle of the DJs – Boston vs. NY! • Ballroom Lounge & Bar! • New Year’s Eve Dinner Show! Sunshine State Dance Challenge is setting a new level of competition, under one roof there will be Country & Western, Salsa, DanceSport, Swing, Hustle, and more! Four ballrooms will be active with workshops, competitions, and parties until the sun comes up! Pro-Am, Couples Line, Team , fabulous Saturday Night Dinner and Show, proceeds to "Make A Wish" foundation. Fully UCWDC Sanction Event, Worlds qualifying event. Also WSDC point awarded. You do not want to miss Saturday Country Redneck Pool Party and Sunday Luau. 3 Full Progressive Tracks of Instruction! Saturday night open competition. Finals to live music performed by 10 piece vintage - Nouveau Passe Band! Featuring: Fabulous workshops with top dance instructors, all night dance party, large dance floor, competition categories for all levels of dancers and dance styles, and a variety of vendors.